Simply hold the PainGone pen in your hand and place on the point of pain then click the red push button 30 to 40 times. What is it used for? Pain gone has provided relief for thousands of people across the UK. we regularly receive testimonials from customers who have benefited from Pain gone to help with Back joint, muscle and sporting injury pain. How successful is it? Paingone's unique form of TNS therapy us achieving an overwhelming success rate. with 92% of suffers reporting a drastic improvement in their condition. Is it easy to use? You simply hold Pain gone pen in your hand and place on the point of pain then click the button. PainGone has provided relief of many painful conditions such as back, joint, muscle and sporting injury pain. Do Not Use Pain Gone -If you use a Pacemaker -If you suspect you are in your first 16 weeks of Pregnancy -In and around your eyes. -Over Implanted metal parts -On Wet Skin or in damp surroundings -Close to oxygen or inflammable liquids. Do not allow children under the age of 8 to use Pain-Gone without Adult Supervision. A: The PAINGONE pen delivers a controlled electronic frequency straight to the point of pain. This electronic impulse encourages your body to produce it's own natural pain reliever - Endorphins. PAINGONE's unique form of TNS therapy (Transcutaneous Nerve Stimulation) provides prolonged and often instant relief from pain, and helps to promote the body's own healing process. PAINGONE uses self-contained crystal elements to provide the high voltage electronic pulse. Q: What conditions has PAINGONE successfully treated? A: It has had great success with relief of pain from chronic conditions such as arthritis, osteoporosis, spondolitis, rheumatism, sciatica, migraine and inflammatory conditions. In fact most physical pains will respond to PAINGONE treatment. Q: How successful is it? A: PAINGONE's unique form of pain relief therapy is achieving an overwhelming success rate with 95% of sufferers reporting a drastic improvement in their condition. Q: Is it clinically proven to work? A: Yes. PAINGONE is clinically proven to provide pain relief and is successfully used in N.H.S. hospitals and pain clinics. PAINGONE meets the stringent requirements of the European Medical Devices Directive - this is why it carries the C.E. stamp - the European Seal of Approval. PAIN GONE is a class 2a medical product. A: Yes. There are no leads, pads or complicated settings involved. 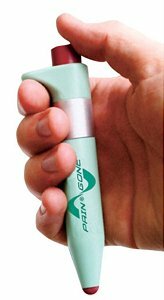 You simply hold the PAINGONE pen in your hand, place the end of the pen at the point of the pain and click the red push button 30 to 40 times. This only takes a few seconds to a minute to do, and the relief is often instant. The PAINGONE pen is safe and effective with use through light clothing. A: In many cases PAINGONE will promote pain relief almost immediately or within a few days. However, some conditions may take up to two weeks of a few simple one minute treatments per day before full relief is achieved. Q: Is it safe? A: Yes. PAINGONE is extremely safe. It is clinically proven to have NO side effects whatsoever, and will NOT effect any form of medication prescribed by your doctor. Q: Can I over use it?